The crumbling mansions of Panam City. Sonargaon is a town in the Dhaka Division. It has survived through many historical periods under the rule of various sultanates and empires, and was one of the original capitals of the Bengal region. Sonargaon is one of the oldest capitals of Bengal. It became the seat of the Hindu Deva Dynasty in the mid-13th century. But this was short-lived, as Hindu rule ended in the early 14th century. Sonargaon was under independent rule for some years, before becoming a subsidiary capital of the Sultanate of Bengal, then the Sultanate of Delhi. The city ended up in the hands of the Mughal Empire after their rise to power across the subcontinent. The British eventually took control of the region, and although it lost much of its significance, the city was further developed with a new neighbourhood settled by wealthy Hindu merchants named Panam City. Much of the old Hindu and Mughal buildings are gone or ruined, but some have survived. Many of the British-era structures are still present today. Frequent bus services to Sonargaon operate from Gulistan, Saidabad and other bus stands in Dhaka. Tickets may be bought on roadside counters. The price of the ticket from Gulistan bus stand is Tk 35, and the ride should take about 40 minutes, depending on the unpredictable traffic. Mention your destination as Mograpara, or else you might end up at the Pan Pacific Sonargaon Hotel in Dhaka, rather than the town in the countryside. 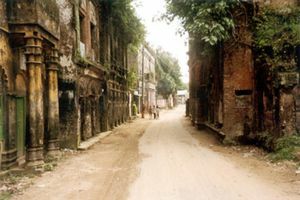 Sonargaon is the combination of many villages and towns. These are all located in close proximity to each other. The easiest, and most enjoyable way to get around is simply by rickshaw. Many rickshaw drivers can be hired for the day for about Tk 200-250. This will save the hassle of having to wave one down and negotiate fares each time. There are a number of shops located near the bus stand, on the Dhaka-Chittagong Highway. Nearby, Sonargaon Royal resort has opened, with the room rates lowest starting from 7000 taka. This page was last edited on 13 February 2017, at 10:05.